How to convert from timecode to frames? 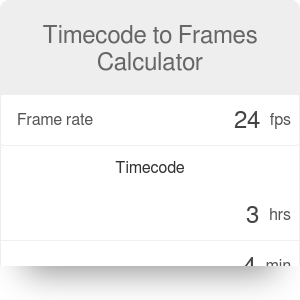 If you sometimes dabble in video editing, this timecode to frames calculator will save you the time needed to convert from a timecode to frame number. You can also use it to check how the number of frames in your video depends on the frame rate. For the conversion from frames to timecode, check the timecode calculator. Every frame in a video is described by a sequence of numbers, called a timecode. If, for example, you would like to locate the end of a particular scene in a movie, you would most likely write down the timecode that describes the last frame of that scene. where HH stands for hours, MM for minutes, SS for seconds, and FR for frames. For example, consider the timecode 00:08:35:13. It describes a frame that will be shown within 8 minutes, 35 seconds and 13 frames from the beginning of the video. Every video consists of video frames - pictures shown one after the other. The number of frames shown during one second is called the frame rate. The higher the frame rate, the smoother the transitions are. For example, animations, with frame rates about 12 fps (frames per second), may look a bit "crude." On the other hand, experimental movies with 60 fps or more seem incredibly smooth. The most common frame rate is 24 fps. This number of frames guarantees that the human eye will not perceive the video as a series of images, but rather as a "moving image." Using this timecode to frames calculator is a piece of cake! All you have to do is input the timecode into the four designated fields and determine the frame rate you'd like to use. the 15,463rd frame in the case of 30 frames per second. Interested in how many gigabytes will your video have? Make sure to check out the video file size calculator! Timecode to Frames Calculator can be embedded on your website to enrich the content you wrote and make it easier for your visitors to understand your message.